button. An LED lights to show you which menu is active. You select a feature by pressing a button. It's as easy as using a computer touch screen! menus are clearly printed on the front panel. Bypass the menu by keying in a simple two letter commands. When you select a feature the keyer tells you its status in CW. Memory is expandable to over 8000 characters. You can expand the MFJ-492 standard 192 characters in four soft sectored message memories to over 8000 characters in eight message memories by simply plugging in the MFJ-80. Memory expansion Kit, Memories are backed up by lithium battery. punctuation or prosigns or any combination for practice using standard 5 character groups, more realistic 1 to 8 character groups or select specific six character sets to work on. 1. Message Repeat. Repeat messages continuously. You can also insert pauses within a message. Call CQ, listen for an answer and then resume calling by pressing a button -- makes a perfect automatic beacon. 2. Message Call. you can store QTH, rig, weather and other information in separate message memories and play in any sequence you want. 3. Message Edit. Correct mistakes while recording a message -- you don't have to start all over because you made a mistake. dot/dash paddles, adjust weight from 5 to 95% and compensate for transmitter distortion, direct and grid block keying, keys solid state and tube rigs. Special MARS characters are recognized. 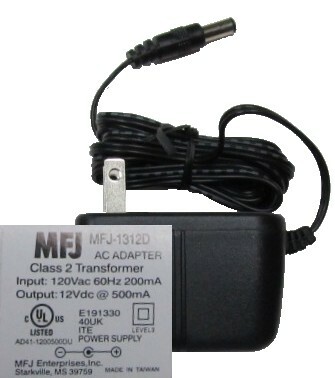 Uses 9 Volt battery (not included), 12Vdc or 110Vac with MFJ-1312D.